scrumplicious | Vegetarian cooking – improving my world, one dish at a time. Vegetarian cooking – improving my world, one dish at a time. Well, That Was A Break and a Half!!! I am posting this after showing it to my brother. He advised me to put it out there as a tribute to my wonderful daughter. 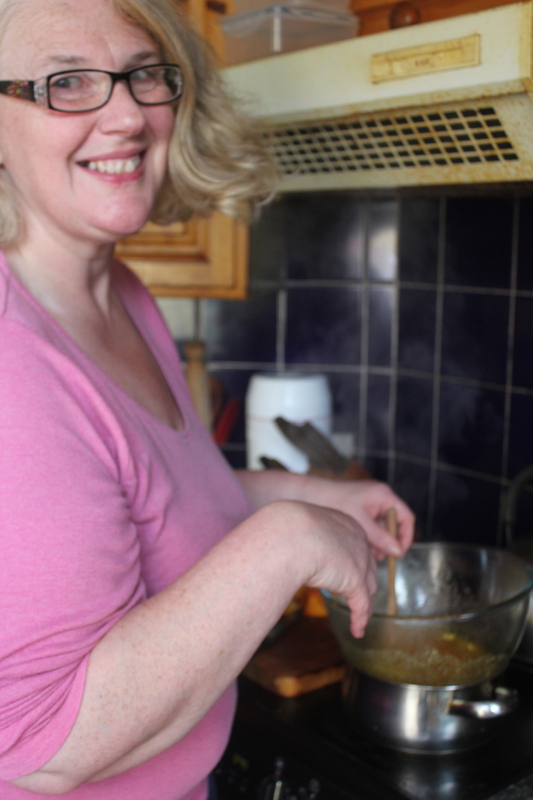 I cannot believe that it’s been almost a year since I last posted on my wee cooking blog. This has been due to some unfortunate circumstances. As previously mentioned, my son left home to go to university, and I went back to work as my daughter was deemed old enough to cope with her health problems on her own and didn’t require a carer. She ended up having numerous hospital admissions, more in the last year then in the entire previous 14 years since she was diagnosed as a Type 1 Diabetic. And, on the 24th of January 2018, she died. In her sleep. I am lost. Bereft. I still cannot believe it. People tell me how strong I am, how marvellously I’m doing. What they don’t see is the tears that roll down my cheeks as I type this on what was her 18th birthday present. She only had this laptop for 3 weeks. They don’t hear the primal screams that rend from my body as I stuff a pillow into my mouth so that nobody knows the utter desolation I feel. And I don’t even know why. Post Mortems should give you answers. Was it a Diabetic seizure? Some undiagnosed heart condition? An anurism? ‘Inconclusive’ is NOT what you want to hear. With so many medical breakthroughs, how can they not tell what killed my beautiful, bright, intelligent girl, who was on the cusp of life? I’m currently awaiting results of more tests that have had to be sent off. I hope something comes back. But Google, always the first resort of those with burning questions and no patience, informs me that 5% of all Sudden Adult Death (SAD) victims remain unexplained. So, what was she like? Many of her friends contacted me to ask for permission to attend the funeral. And every single one mentioned how kind she was, what a good friend, how thoughtful and caring. She was geeky and nerdy. A gamer. Loved music. She was also wickedly funny.She made me laugh. She adored her brother, looked up to him, even when they were fighting. It reminded me of my relationship with my own brother. The same 2.5 year age gap. Fights, slammed doors etc. But if anyone tried to mess with their sibling………watch out. And she had plans. Doing an NC in Social Sciences course at college, she’d applied to go on the HNC course. She’d volunteered to work with Riding for the Disabled. 2 days before she died, I’d been helping her write a job application for a Saturday job. It didn’t save properly, so we were going to do it again. The house is now too big for me. I’ll probably have to move. But my memories are here, shouting upstairs ‘what do you want for dinner’ to hear her voice wafting back ‘something nice’. Clearing her room is taking too long as I pick items up and remember how excited she was when they were bought. Or finding things that I’d long forgotten. And just knowing that she’d be horrified that I was, finally, getting to clean her room. I’ll probably never post this, just wanted to get it down while it was still raw, before time blunts the hurt. Because it will blunt it. Just never cure it. So, it’s Easter, you expect a recipe for Hot Cross Buns/Chocolate eggs/a cake with cute chicks strewn over it? Jog on!!! Well, okay, it might have started out as something like that, but once I’d gotten the ingredients out, I looked at them and the word ‘bannock’ just appeared in my brain. I do sometimes wish it’d stop doing that. Wassat? You don’t know what a Bannock is? Traditional Scottish bread. Well, technically, that’s what it is, but, oh, so much more. Traditionally, it’s a bread that poor people can make without an oven, with few ingredients, on the move. It can be cooked on a girdle or frying pan, and there’s a fair few versions. Selkirk, Fife, Wheaten, Yetholm………special ones depending on the time of year……Yule, Lammas, Saimhain etc. 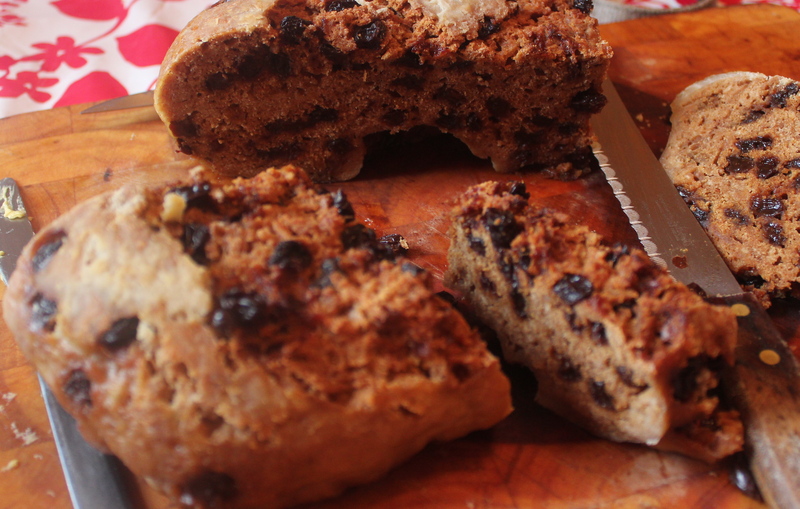 This one is a Selkirk Bannock, originally cooked by a chap called Robert Douglas. As Douglas was my grandmothers maiden name, and it hails from the Scottish Borders, which is where Selkirk is, I’ve got a sneaky liking for this sweetened version. I rather feel it connects me to my roots. Unfortunately, after telling you don’t need an oven to cook your Bannock – this is one of the few times you do need one. 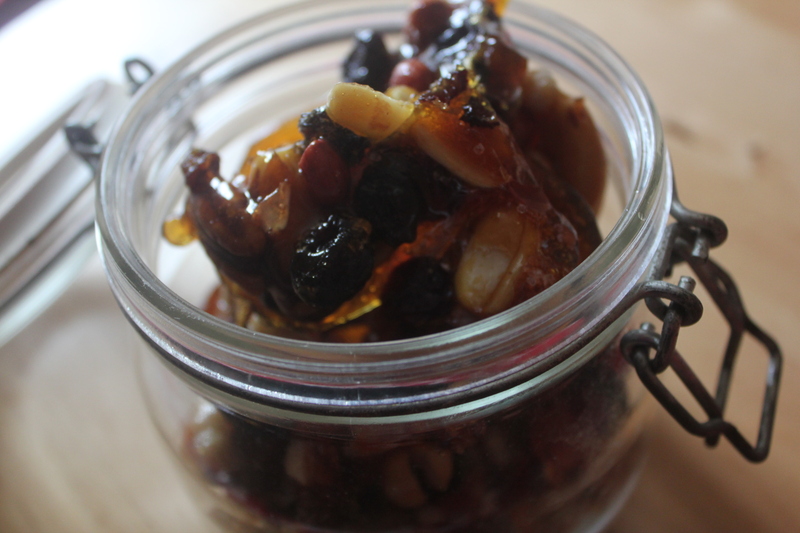 There’s so much dried fruit in, it just won’t cook properly without one. Oh, one more thing, this makes a LARGE Bannock. You could either half the quantities and reduce the cooking time, or else try making it in 2 x 2lb loaf tins. But I like the more ‘rustic’ free form, so I’ll stick with that. Cream together your butter and sugar, then add the flour, yeast and salt. Then add the milk to form a dough. It shouldn’t be sticky, but knead it for 10 minutes till it becomes silky and elastic. Then cover it and leave it in a warm place to rise to about double in size. 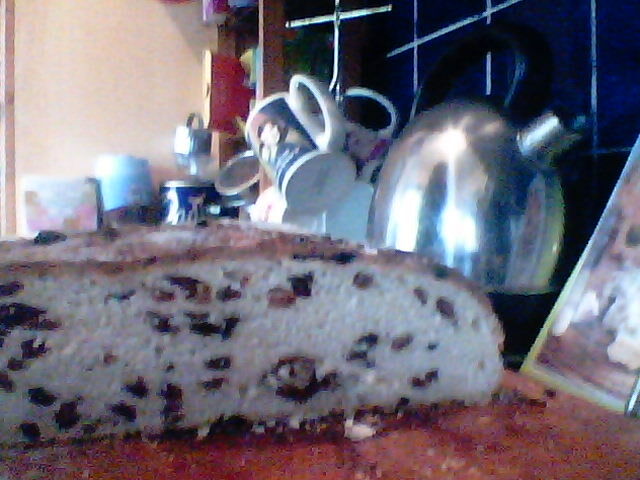 Once it’s risen, punch it backdown, pull it into a rectangle and scatter the sultanas over it. 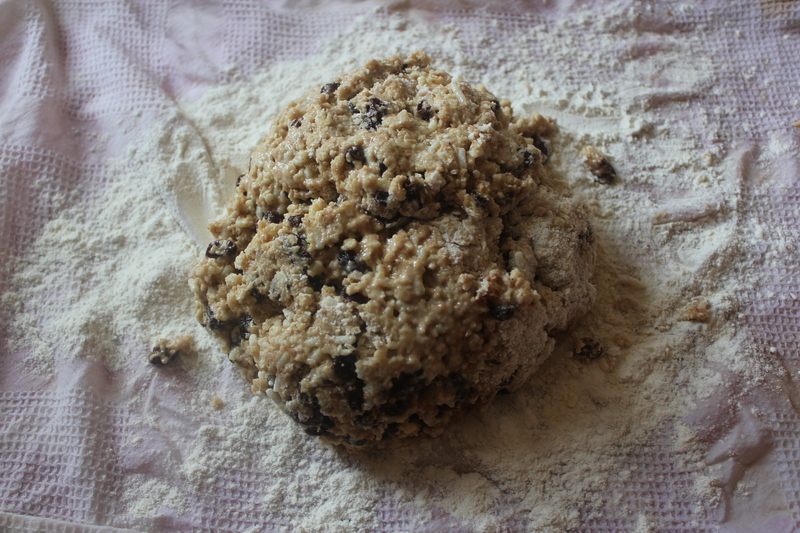 Then knead it again until they’re all incorporated into the dough. Shape it into a round and place on a lightly greased baking sheet and leave aside to prove again for about 40 minutes. Put your oven on at 190°C while this is happening. Bake your Bannock for approx an hour, then take it out and paint with the beaten egg wash. Scatter over the tablespoon of sugar, then bake for another 10 to 15 minutes. Then let it cool on a wire rack. 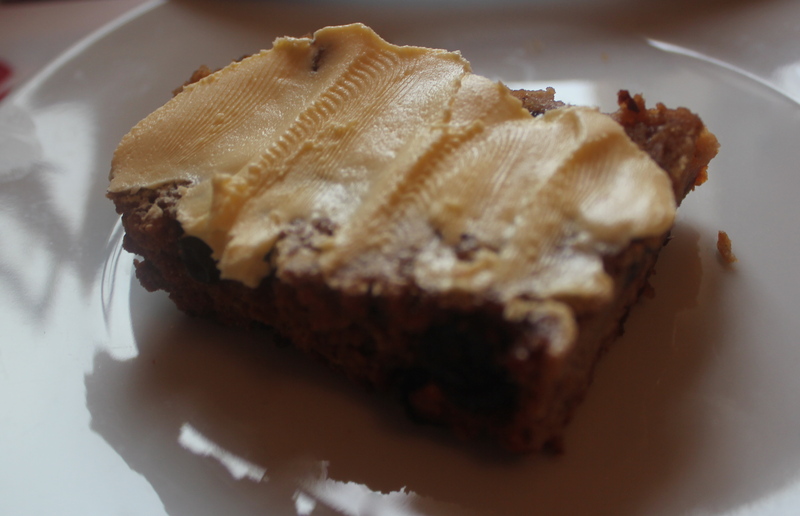 It tastes rather like a denser version of Pannetone, and is so good toasted with a cup of tea, or even used in a Bread and Butter Pudding. And, if you’ve got some, try using Vanilla Sugar instead of normal. It takes it to a whole new level!!!! Wow, I hadn’t realized how long it’d been since I’d blogged. So much going on, work has been exhausting, another hospital admission for my daughter, Christmas and New Year……oh, and my beloved Apple G5 finally died. Bought second hand 10 years ago, it’s been a wonderful computer that did everything I asked of it. I’m currently saving for a new computer, but in the meantime, I’m going to try and update here using my Acer tablet, and Google Drive to store my photos. All new to me, thank goodness I have a very tech savvy teenage son to help his poor old mum whos’ first PC was a ZX Spectrum +. Ah, the good old days – I remember when 8″ floppy discs were the way to go!!!! Anyway, what have I been up to? Well, remember I went back to work? Doing admin in an office, nowhere near a kitchen? Aye, well, here’s a tip for you – when you put ‘able and willing to go above and beyond the call of duty’ on your CV, you better mean it!!!! So, the chef’s off and there’s no-one else to cook, and your boss remembers you saying you could cook? 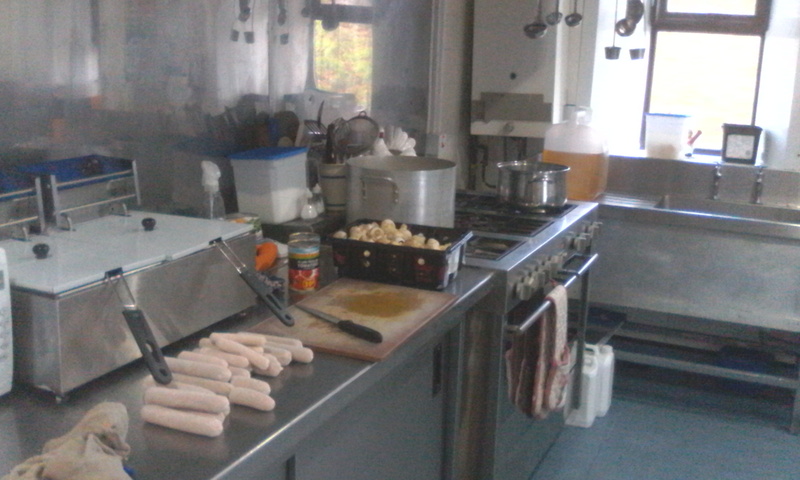 Guess who stepped in and got the run of a professional kitchen for the day? Only sightly problematic in that, as a vegetarian, I couldn’t taste some of it, but other staff members seemed quite keen to help me out there. Hmmm……. 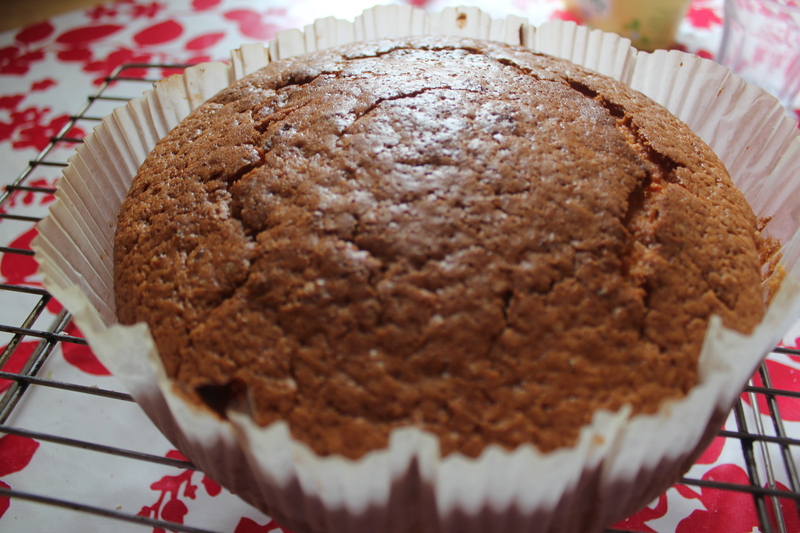 So, just to ease myself back into the blogging vibe, and as I’ve been clearing out my fridge, a nice and easy Lentil soup that we had for lunch today along with (just a photo of) a Victoria sponge cake. 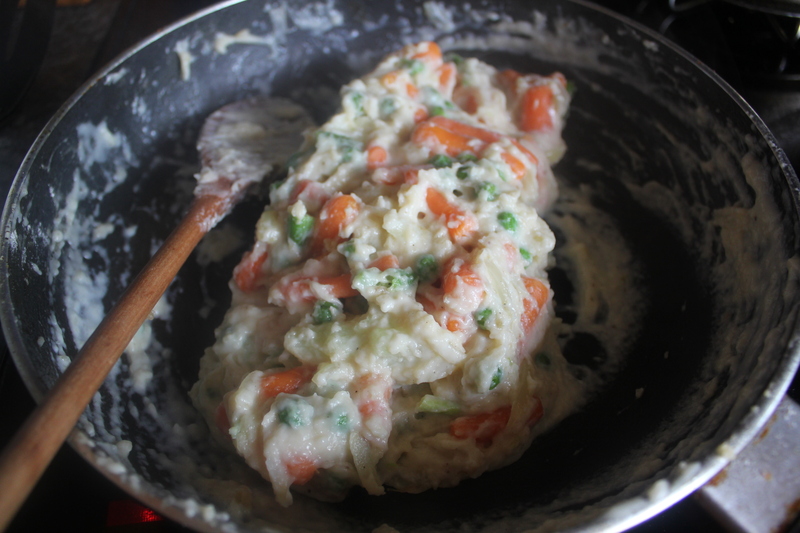 2 – 3 cups of finely diced vegetables. 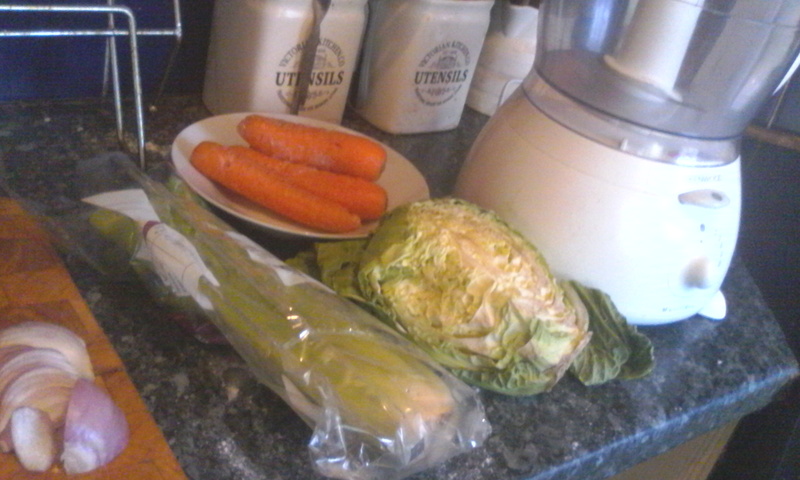 I had some celery, quarter of a cabbage, an onion and a couple of carrots hanging around the fridge. Chop the vegetables finely, best done in a processor, and throw into a large pot with the oil, place over a high heat, and stir until they’re coated and starting to soften. Crumble in the stock cubes and add the boiling water . 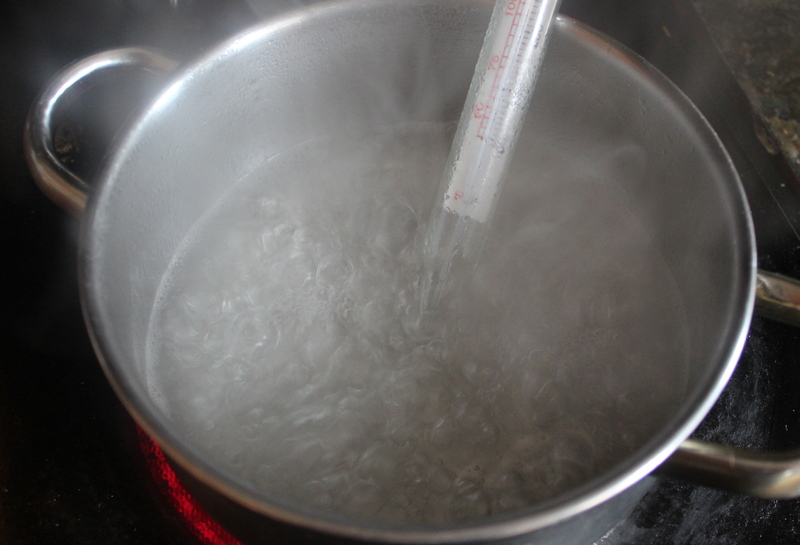 educe the heat to a gentle simmer and place a lid on it and let it cook for at least an hour. 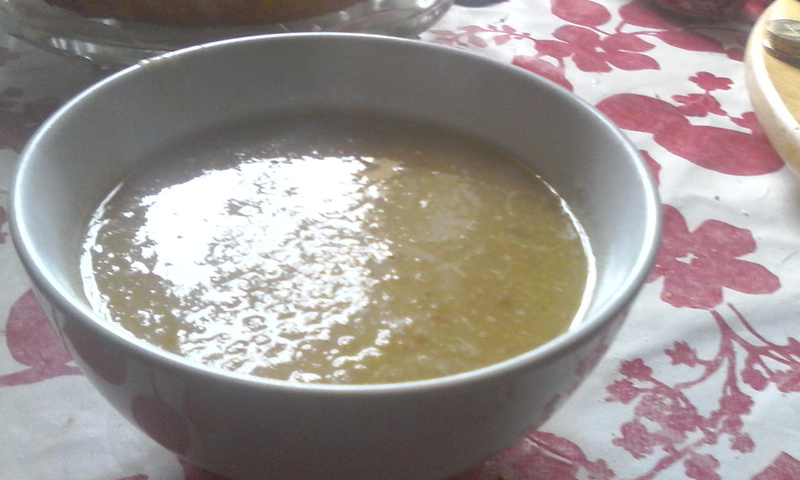 Once the lentil have softened to mush, go in with a stick blender and blitz till you’re got the consistancy you want. 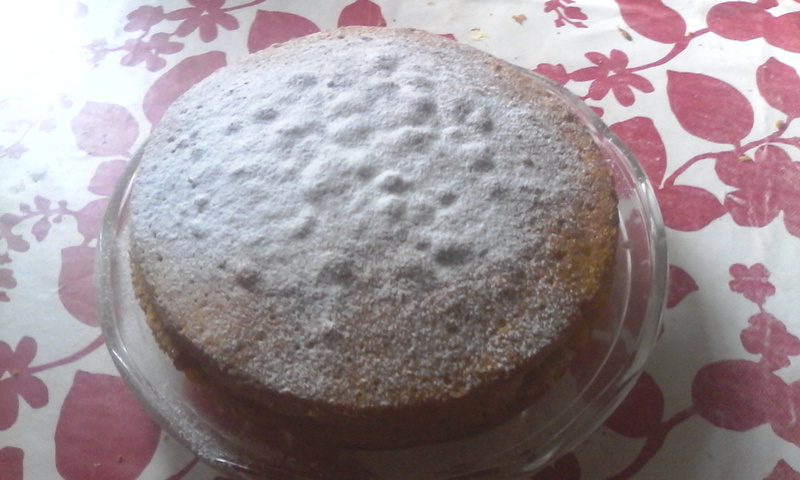 And the Victoria sponge turned out pretty well……..
And, just to finish the clear out, how about a cheese and fajita omlet? With sweet and sour sauce no less!!!! I really hate food waste!!!!! So, what’s been happening since I last posted? Well, the government decided that my daughter doesn’t need a carer any more, so I was told to look for work, and I found it, and started p/t in an office. All well and good. In fact, she doesn’t need a carer so much that she’s been in the High Dependency Unit of our ‘local’ hospital (I laughingly say that as it’s only 3 trains and a bus ride away) twice in the last 6 weeks. So food, and blogging has really been the last thing on my mind. So, bear with me, normal service will be resumed as soon as possible. Salted caramel, popcorn, toffee………you can barely move in supermarkets for products mixing salt with sweet. And, no excuses, but we all need something sweet in our lives sometimes, right? It’s not like I can even say ‘oh, this’d be lovely round the bonfire on the 5th of November’, or ‘this would be great as a home-made Christmas present’ (though it would be terrific on those occasions). It’s too early for that. I just made this because, well, I wanted to. 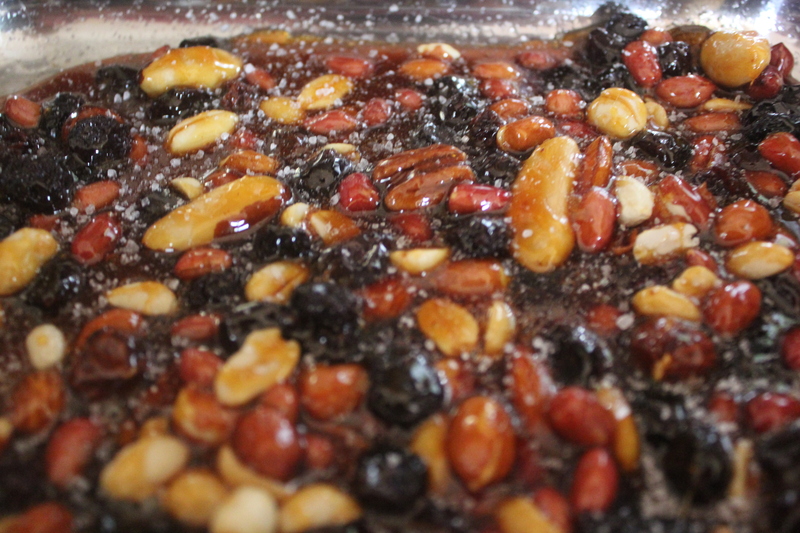 225g mixed nuts and raisins (do make sure they’re unsalted as we’re adding more salt at the end). Smear the oil round the bottom and sides of a metal baking tray or roasting pan. 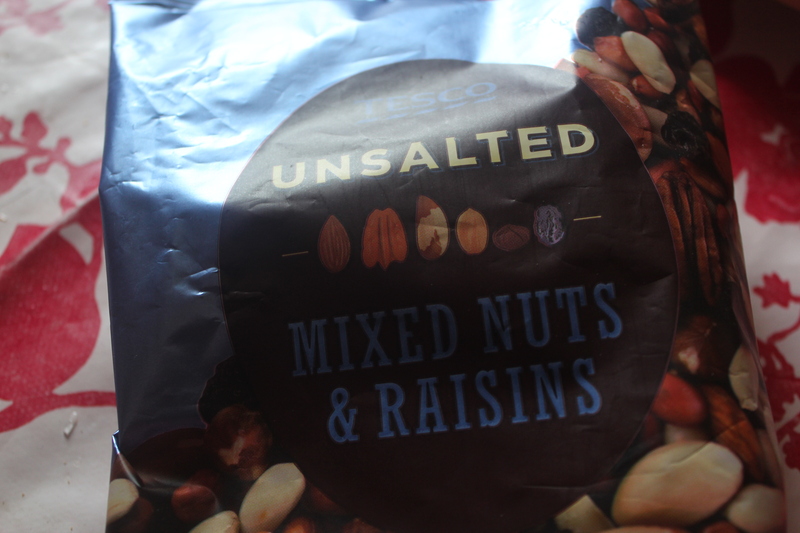 You can buy bags of nuts and fruits from supermarkets, but you could also use up the remains of already opened packets if you’ve got them in your cupboards. 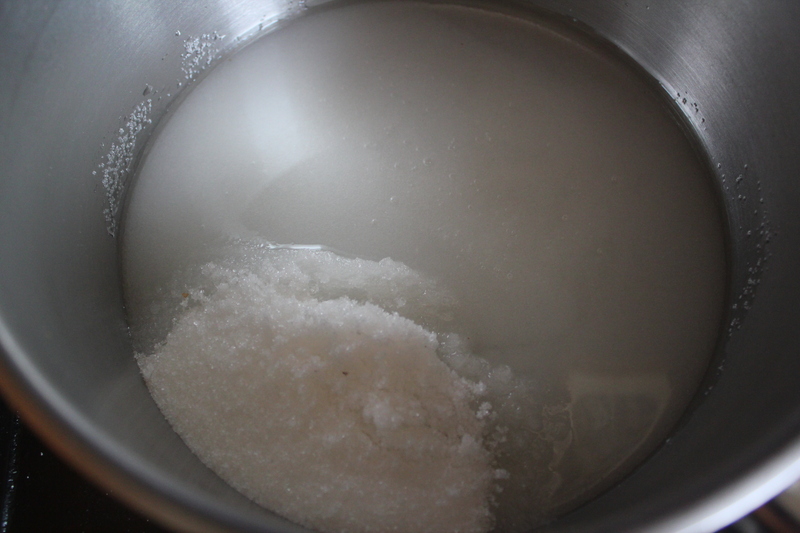 Place your sugar and water in a large, heavy based saucepan and heat gently until the sugar has all dissolved. You can stir it occasionally with a wooden spoon. Once it has dissolved you can stop stirring, put the heat up to medium and keep an eagle eye on it until it darkens and goes a rich, golden colour. Tip in the measured nuts and fruit and stir to coat them all in the sticky caramel then empty the saucepan’s contents onto the oiled tray. Spread it out to a thick layer and sprinkle the sea-salt over the top. Leave to cool for a while and, when you can handle it, place it onto a wire cooking tray till it’s completely cold. Then you can break it up to bite-sized pieces and either store (who am I kidding?) in a airtight container or wrap in cellophane bags. …..till May is oot” is an old Scottish saying that means that the weather in Scotland can be very changeable and that it’s a foolish person who will change into their summer attire before the month of May has finished. There’s always a chance that Winter will come back just when you think you’re safe and bite you in the bum. Hey, my birthday is in May and I can recall shivering in Troon in the middle of a snowstorm in the ’80’s while I tried to celebrate it. It’s also an excellent way of introducing you to an old Scots word ‘cloot‘ which means ‘cloth’. 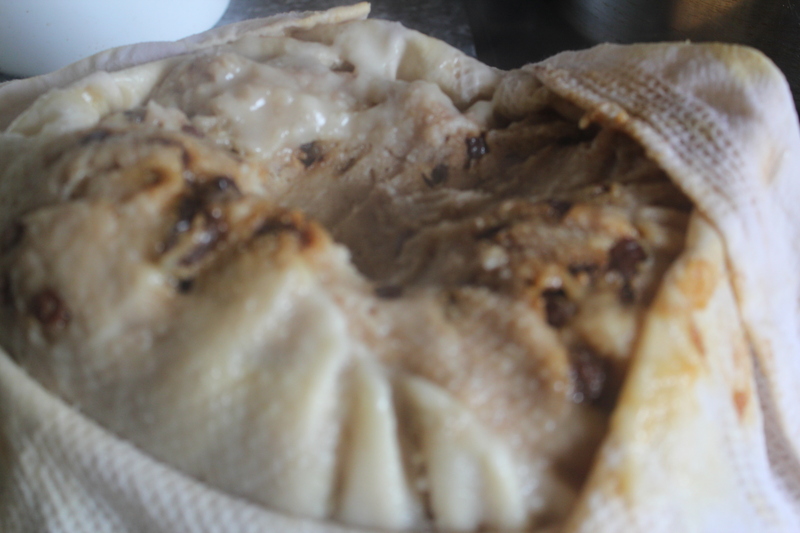 We have a traditional dumpling, called a ‘Clootie Dumpling‘ which you wrap in a cloth before boiling it. You can also microwave it, and I have recently been given one, but I think that, for now, the traditional method is probably the best. If it isn’t broken, why try to fix it? 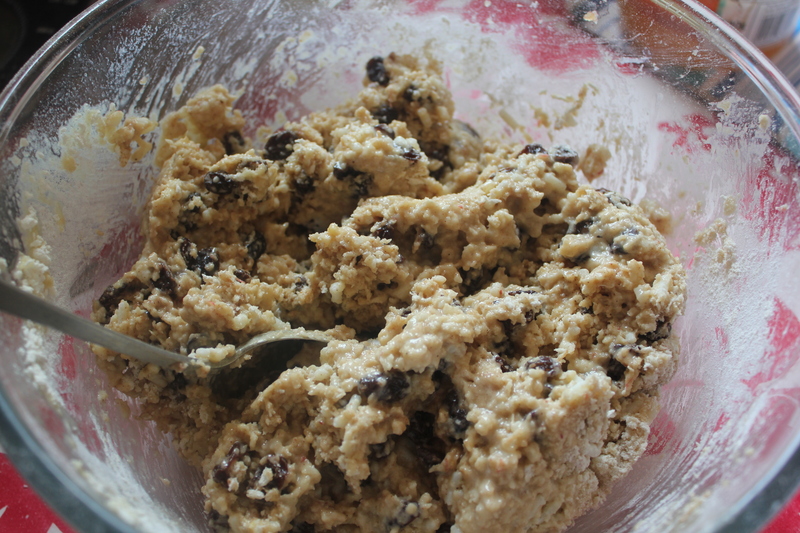 Take a large bowl and put the dry ingredients (flour, suet, baking powder, breadcrumbs, sugar, apple, raisins, and the spices) and mix them together. Break the eggs into a small bowl, whisk, and then add the golden syrup and the milk, and pour them into the dry ingredients. Mix it together, adding a spot more milk if required. Boil a kettle and get out your largest saucepan and a saucer. 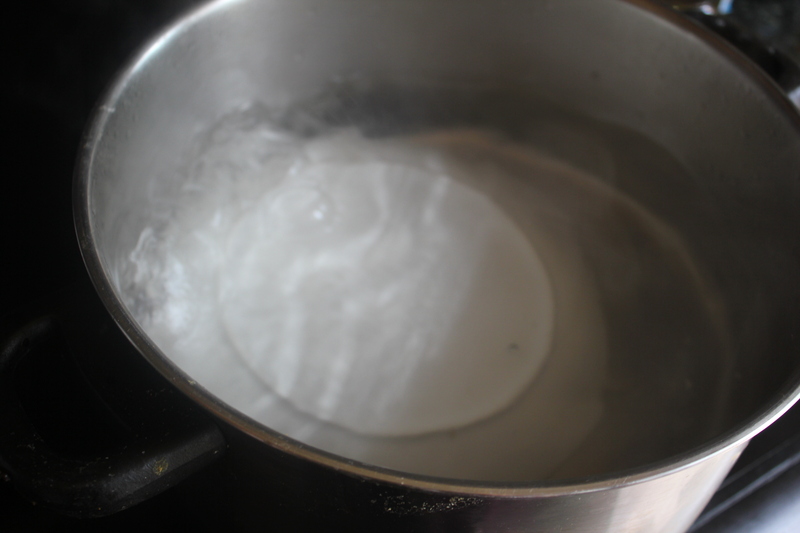 Once the water has boiled put the saucer into the pan and fill it up to the halfway mark. 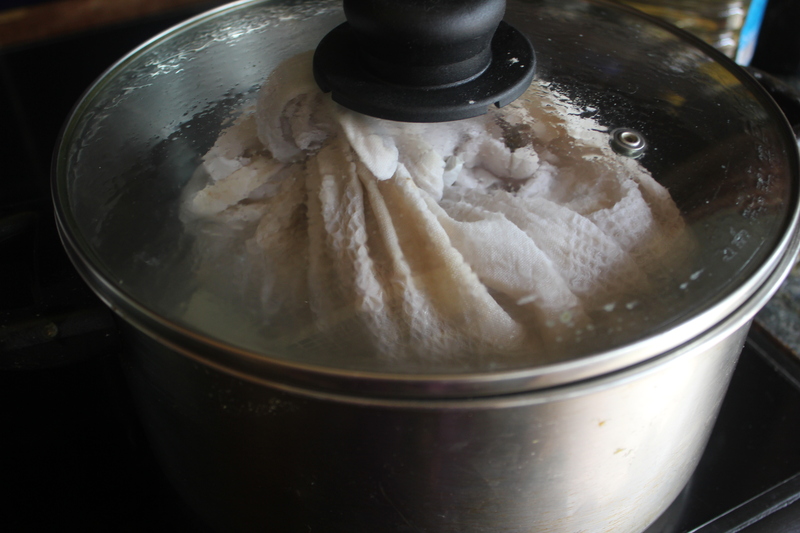 Take a clean tea towel and dip it into the boiling water. Use tongs or at least something to protect your hands. 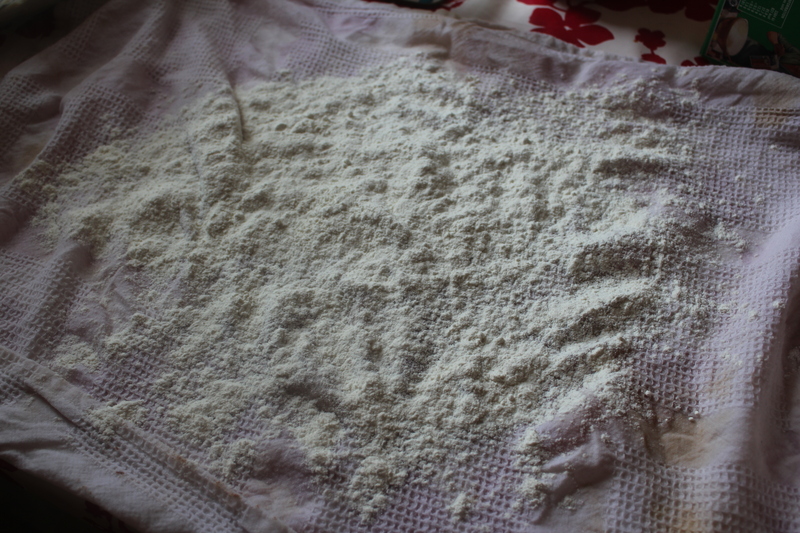 Wring out the cloth and thickly scatter the extra flour onto it. Pile the pudding mix into the centre of the cloth. Pull up the corners and tie them securely but not too tight. The pudding needs room to expand. Place it into the saucepan and turn the heat down to, well, I’d call it a lively simmer. Not quite a ‘rolling’ boil, but more than a simmer. Put a lid on to keep the heat in and don’t let it boil dry. Check it every half hour or so and make sure it doesn’t drop below halfway down the pudding. Top it back up with freshly boiled water, if necessary. Boil it for 3 to 4 hours and then fish it out. It looks revolting. Put it into a preheated oven (80˚C) for about half an hour. It loses the pale colour, dries out, and becomes a burnished brown colour. 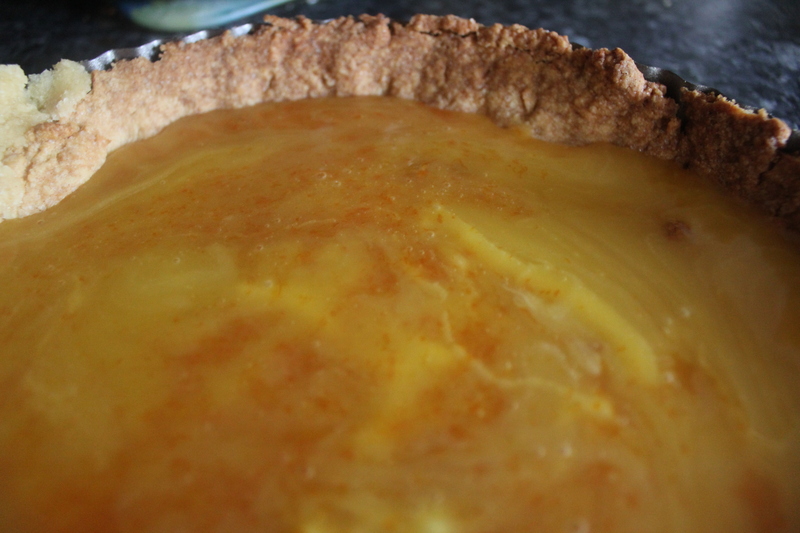 Slice it thickly, and either serve it with custard, or with butter. Oh, and you can also fry it as part of a traditional Scottish cooked breakfast. 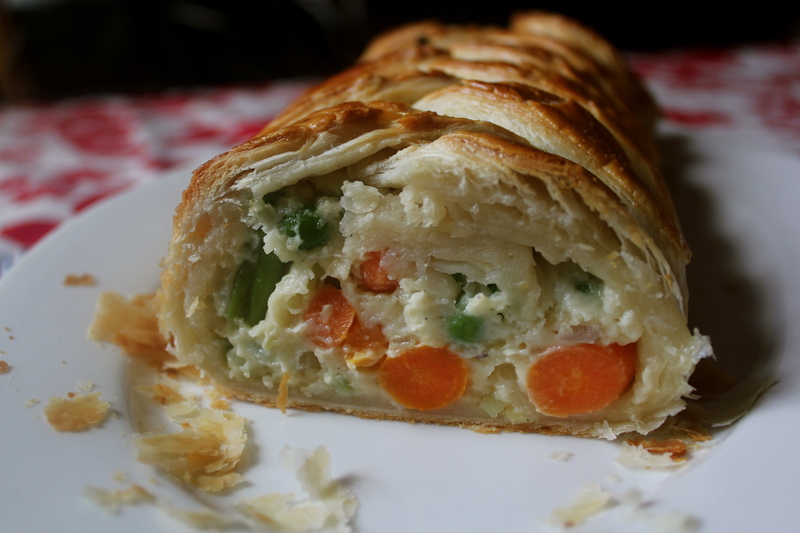 Madam et Monsieur, je presents un Vegetable Mixed et le Béchamel Sauce en Croute. 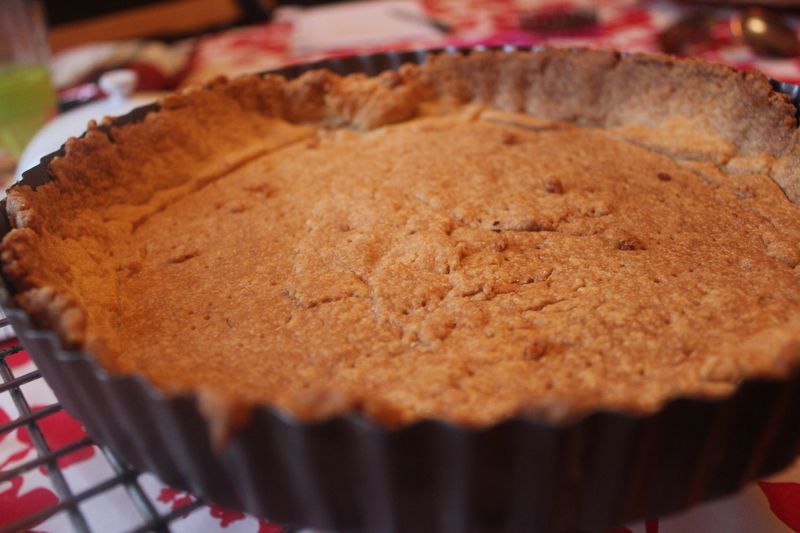 Or, as my son called it………..
‘That pie thingy in the oven’. So, in one swift move, you’ve discovered that my mastery of the French language is appalling, and that my son is a ‘tells it like he see’s it’ kinda guy. Doesn’t really matter, whatever you call this, it’s a very posh looking centrepiece that you can make from some basic ingredients. Just the job when expectations are high and funds are low. 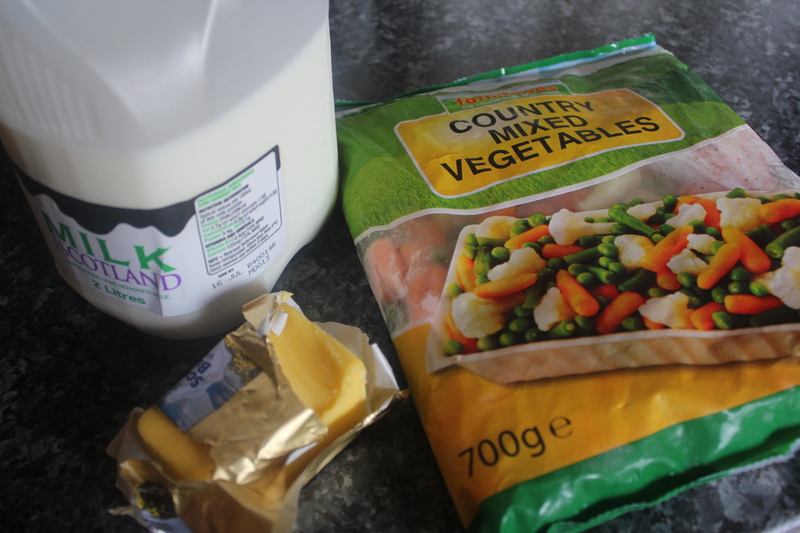 350g frozen mixed veg (I like the ‘Country’ one as it’s got cauliflower in it, but any kind will do). Half a large onion, finely diced. 1 heaped tablespoon of plain flour. 500g block of frozen puff pastry. 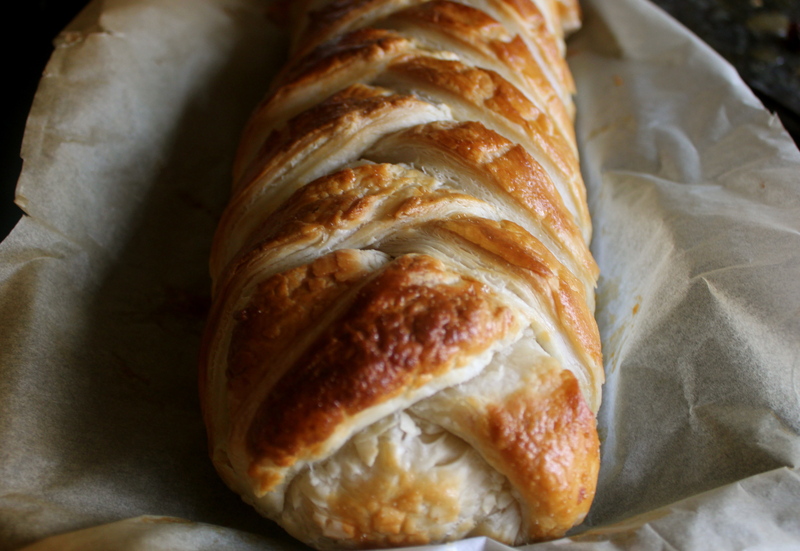 Start off by making the filling a while before you intend assembling the croute. Melt the butter in a large frying pan over a medium heat and add the onion, allow it to soften and go translucent (about 5 mins). Add the frozen vegetables and stir fry them until no longer frozen. 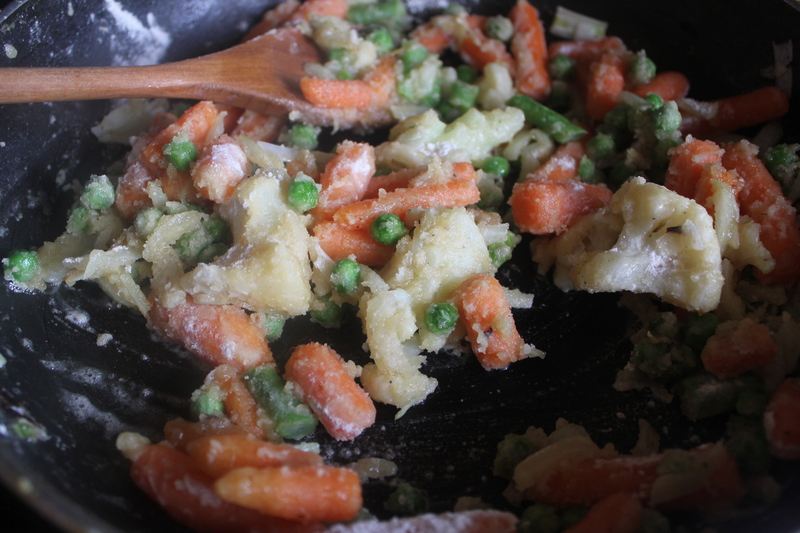 Add the heaped tablespoon of flour and stir to coat all the vegetables in it. Slowly add the milk, stirring well to make sure it’s absorbed. It should be a really thick sauce that will hold it’s shape when you pull it together. 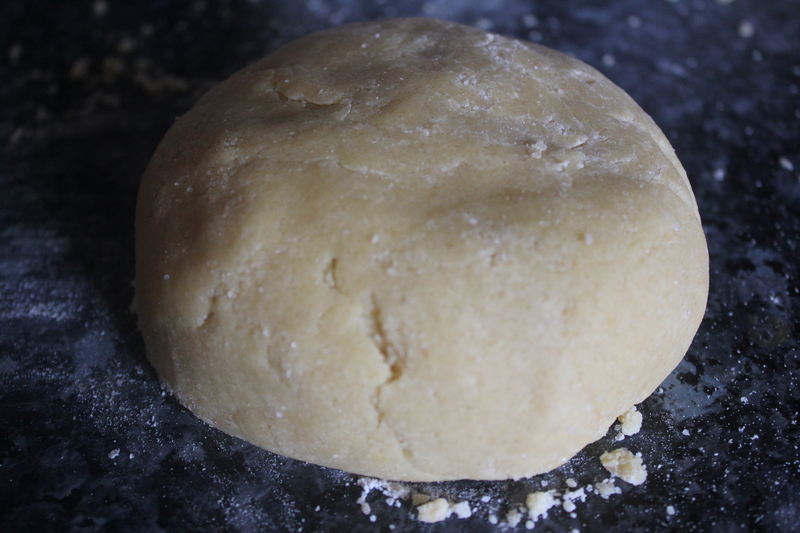 Let it cool for at least an hour before you roll out your pastry into a rectangle approx 20cm x 30cm. 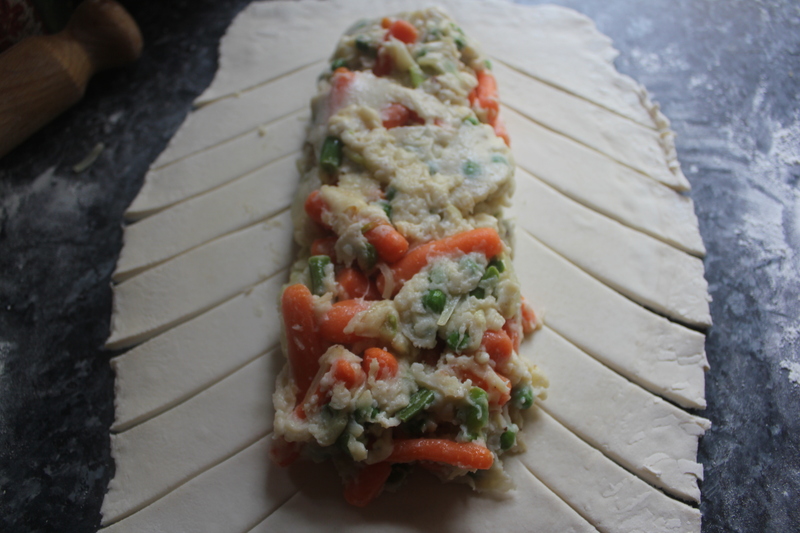 Place the cooked vegetables in the centre of the pastry and slice through the side pastry in roughly 2cm wide ribbons. 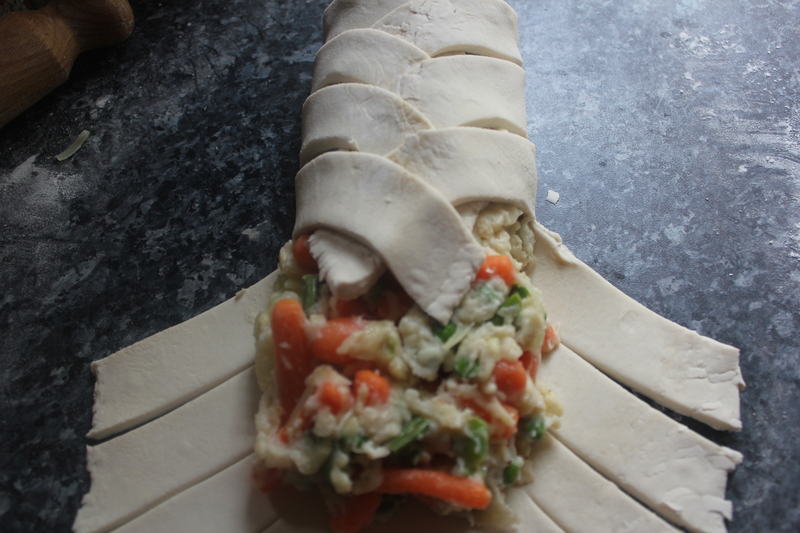 Fold the end piece over and then start weaving the pastry ribbons together, taking first from one side, then the other. Once it’s plaited, paint it with the whisked eggwash to give it a good colour. Place it onto a lined baking tray and place in a preheated oven at 200˚C for 40 – 45mins. Let it cool for about 5 minutes and then serve it, thickly sliced. …..multitasking. One post – 4 recipes, no waffle. Oh, all right, but just a little bit of waffle, promise. Imagine the scene…….oranges and satsumas starting to look a bit pass their best in the fruit bowl, so what do you do with them? 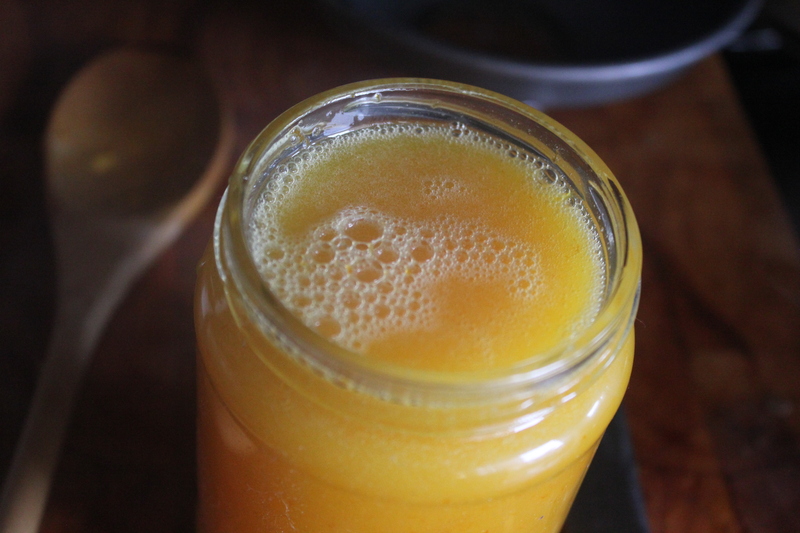 Make orange curd, of course. Then what can you make with orange curd? 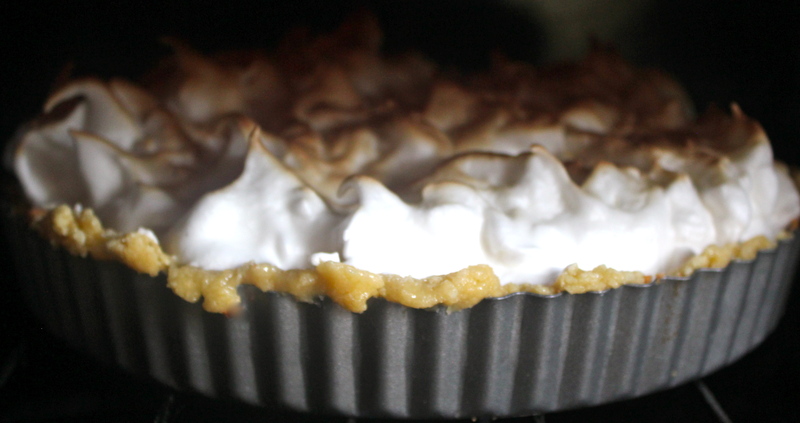 Orange Meringue Pie. So curd, pastry, vanilla sugar and pie recipes follow. And it’s a lot of work. Took me 2 days to make this (curd and pastry case yesterday, meringue today). 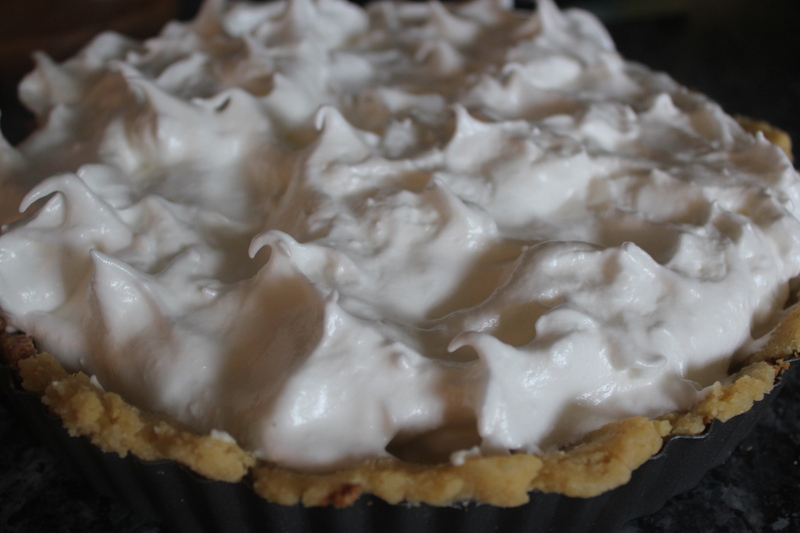 Of course, if you just want a pie, buy the pastry case, a jar of curd and the meringue will take 20 mins, and STILL look impressive. 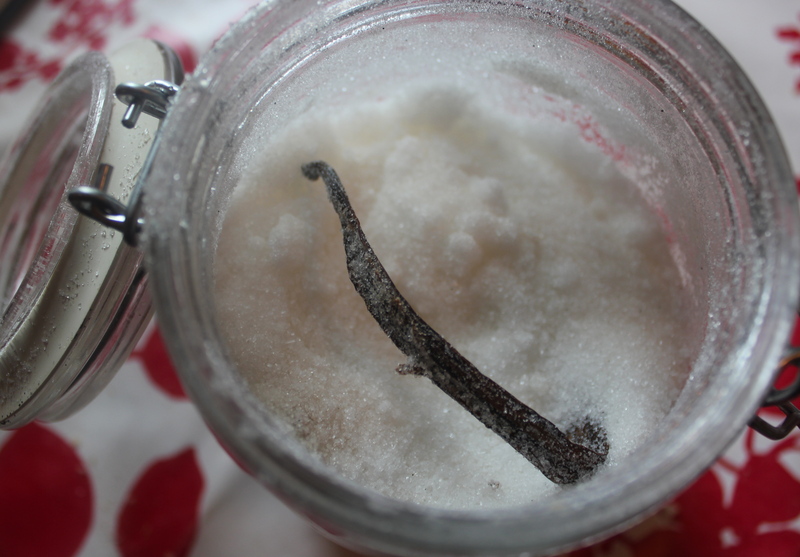 Barely a recipe, just get a large Kilner type jar, fill it with sugar, and pop a couple of used vanilla pods deep into the sugar. In a couple of weeks you’ll have vanilla scented sugar as the vanilla permeates through the sugar, giving your baking an extra depth. Also good when you’re making something like hot chocolate. Oh, and I seem to recall even Nigella saying there were ideal Christmas presents in her Christmas book. Grated zest and juice of 2 large oranges. Or 1 orange and 2 satsumas. Or 4 satsumas etc. 200g sugar (don’t bother using the vanilla for this, it won’t hold up against the orange flavour). 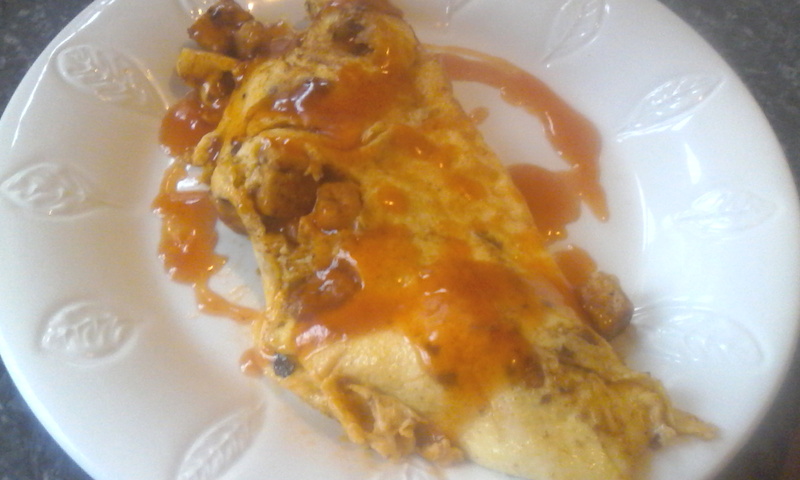 2 whole large eggs, plus 2 egg whites, whisked together. Put all the ingredients, except the eggs, into a large glass mixing bowl and place the bowl over a saucepan of simmering water, making sure the bottom of the bowl isn’t toughing the water and Stir until the butter has melted. Good grief, yes, a photo of me in action, taken by my daughter. Blame her. 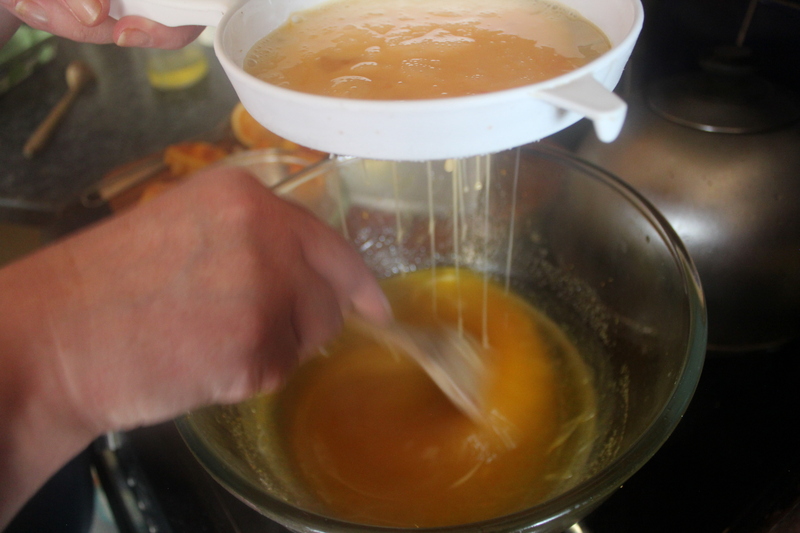 Anyhow, once the butter has melted, take the whisked eggs and sieve them into the orange/butter mix, stirring constantly to avoid the mix becoming orangy scrambled eggs. Sieving gets rid of the glutinous bits from the eggs. Keep stirring until the thickens up and leaves a thick film on the back of a spoon. Then you can pot it in a sterilised jar. 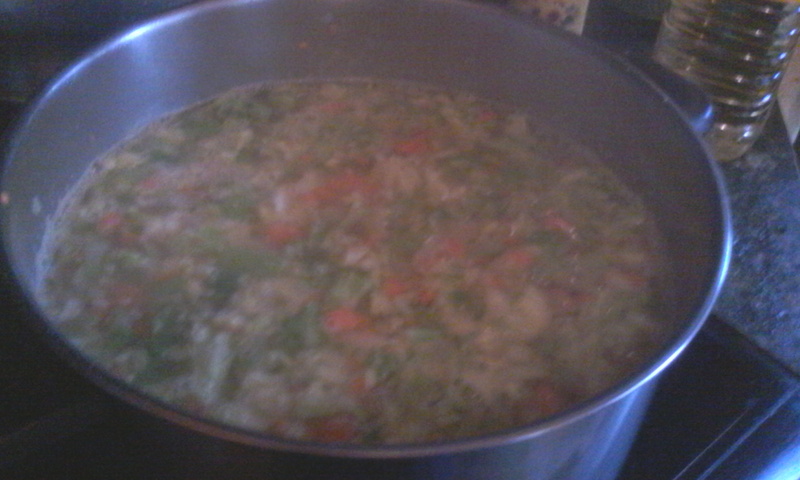 It will get thicker as it cools as well. Now the pastry. We’re on the home stretch now. If you’ve got a food processor, place the first 3 ingredients in it and pulse until it resembles fine breadcrumbs. Keep the motor running and pour the egg down the feed tube and keep processing until it comes together. Take it out and lightly knead it into a ball, cover with clingfilm , and pop it into the fridge to rest for at least half an hour. Not my best one, but at least you know my photos aren’t Photoshopped in any way. And yes, I could have done with making the sides a bit higher. Oh well, you live and learn. So, take your Orange curd and put it in the flan case. While it’s coming to boil, whisk the egg whites till they’re in the ‘soft peaks’ stage. 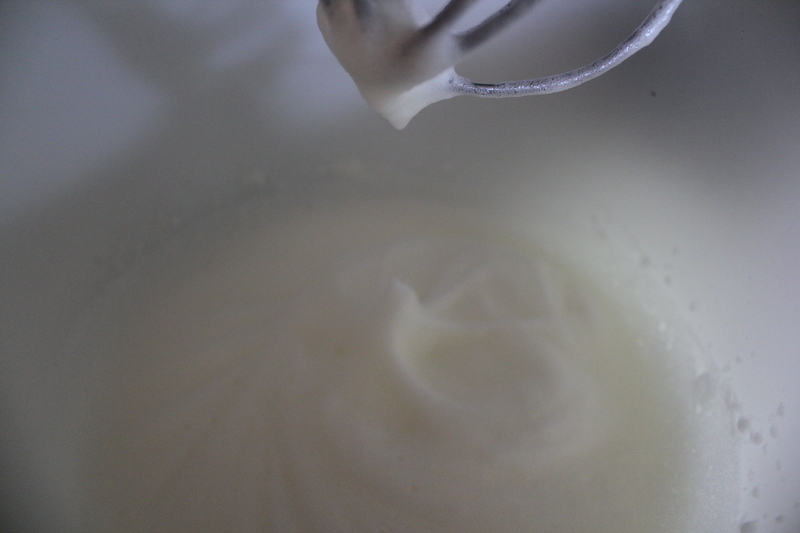 Once the sugar syrup’s ready, slowly pour it into the egg whites with the whisk still going. 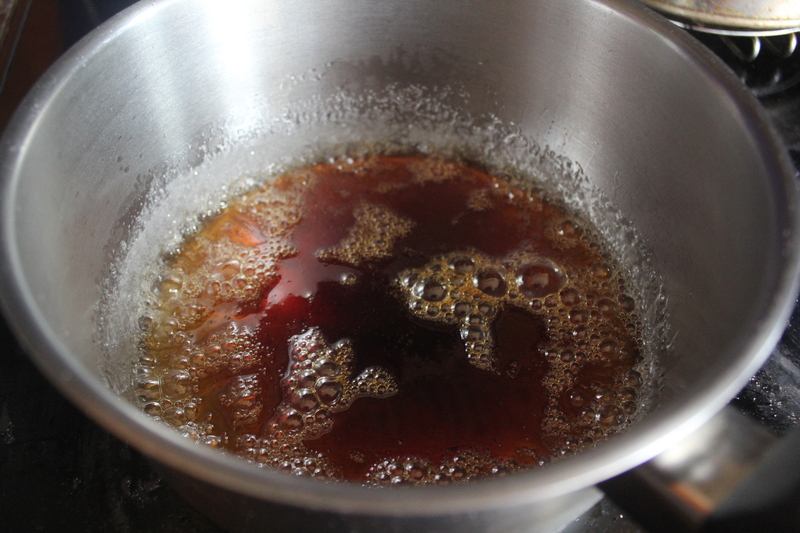 Keep whisking for 5 – 12 minutes until the mixture is thick and glossy and holds it’s shape. Spoon the meringue over the orange curd and, using a pallet knife, flick it into peaks. 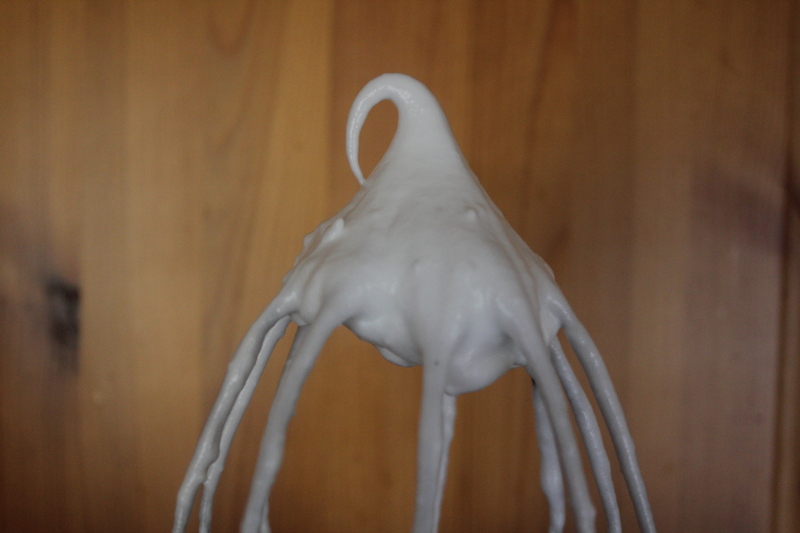 By this, I mean place the knife on the meringue and lift it sharply so the meringue lifts up so that it looks like soft billowly clouds. Stick it under a preheated grill and let the top brown – or at least goldenly glow. Summertime, And The Livin’ Is………. I’m not really a gâteaux gal. If you look back at the cakes I’ve made, I don’t think there’s one. Anywhere. But I follow a page on Facebook for the Scandinavian Kitchen, which is down in London and so somewhere I’ve never been (but if you live close enough then lucky you), but they posted a photo yesterday of what can only be described as the most sumptuous cake I’ve seen in a long time and I had to comment that, if I wanted a piece I’d have to make it myself. 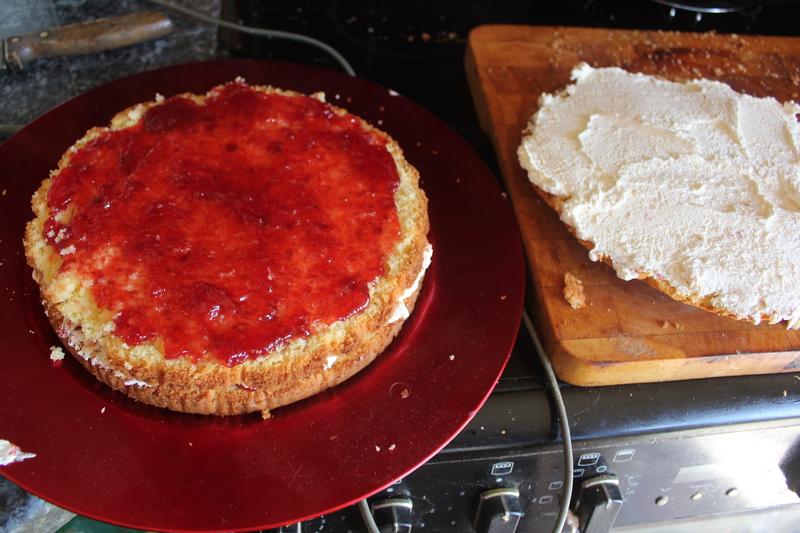 They didn’t post a recipe, so this is my interpretation of what I saw, a kind of Anglo-Scandi cake, using a Madiera sponge cake, sliced with my Ikea ‘Smaksam‘ cake decorating set, and with the principles of a good old-fashioned Victoria sandwich cake. I hope you like it. You can use the ‘all-in-one’ method to make the cake by placing all the cake ingredients into a food processor and beating them together. 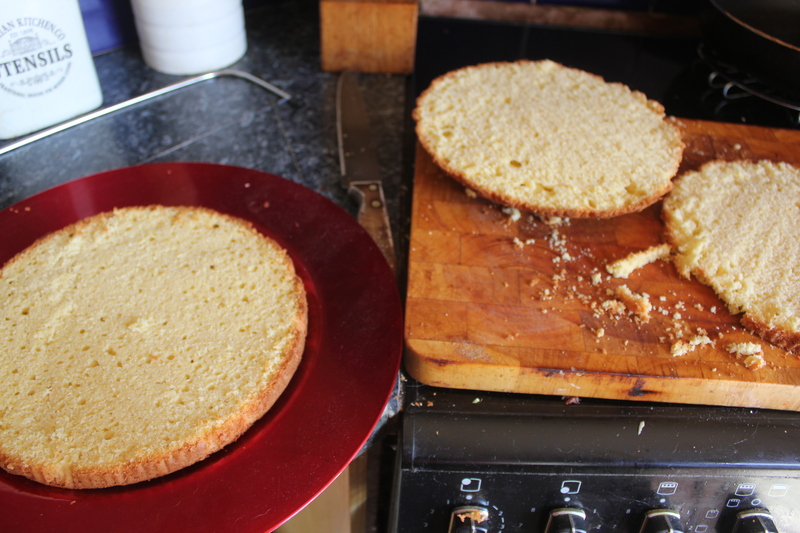 Once the oven is hot enough, scrape the mixture into the cake tin, even the top, and bake for 1 hour/1 hour 15 minutes. Check it’s cooked through by inserting a skewer and it comes out clean. I did this the night before as the cake needs to be completely cold – it makes slicing it so much easier, also trying to spread cream in a warm cake just isn’t going to work. It’ll be nasty. Slice the cake horizontally into 3 slices. If you’ve got a steady hand and a lot of confidence use a very sharp serrated knife. If you’re chicken, like me, try to get hold of a thing that looks like a cheese wire, but it’s for cakes. I got mine in Ikea (link’s above in the intro). 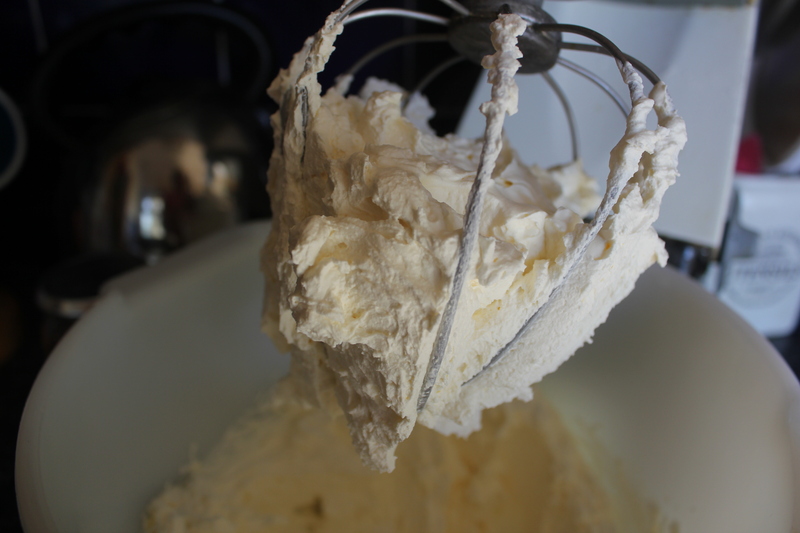 Put the cream, icing sugar and vanilla extract into a food mixer and whisk until thick and spreadable. And then it’s just an assembly job. Place the base piece of sponge on a serving plate and spread with half the jam, then dollop on a large spoonful of the cream and spread it to the edges. Put the middle piece of sponge on top and repeat. Cover the top and sides with most of the remaining cream, but keep a little bit back. 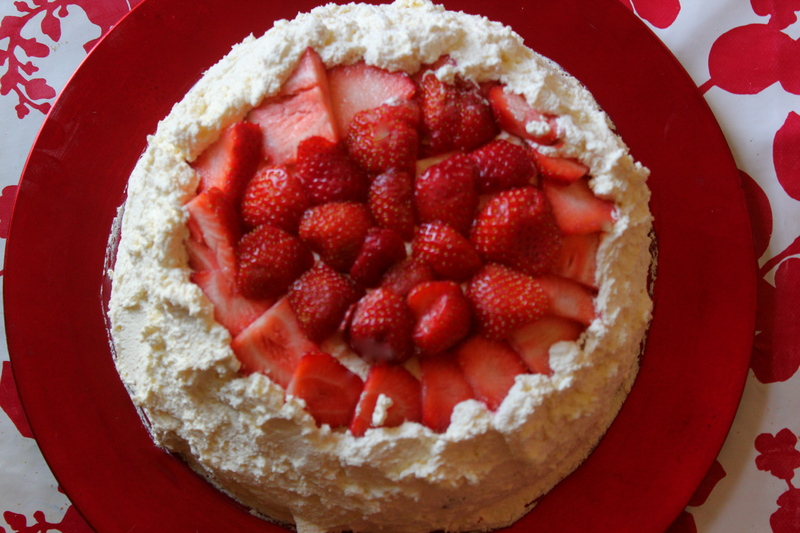 Slice up some of the strawberries and arrange in a circle around the crown of the cake and strew the remaining in the centre of the cake. Now take the remaining cream and carefully go round the top, sort of building a wall to keep the strawberries in place, just so the strawberries don’t slide off. Oh, and don’t forget to wipe the edges of the serving plate!!!! I Tried My Best and Bloody Magazines….. Okay, so, I managed 4 days (which is still a personal best), but for the last 2 days I’ve had a bit of a migraine, so I’ve barely been on the computer and certainly not updating the blog. Hey ho, there’s always next year. But I’m feeling a bit better this morning, so I decided to look through the new BBC Vegetarian Summer magazine that I bought last week, to see if there’s anything I’d like to cook for dinner today. I suddenly had a flash of deja vu – back to the summer of 2013 to be precise and an identical Lentil Rice Salad with Beetroot & Feta Dressing. 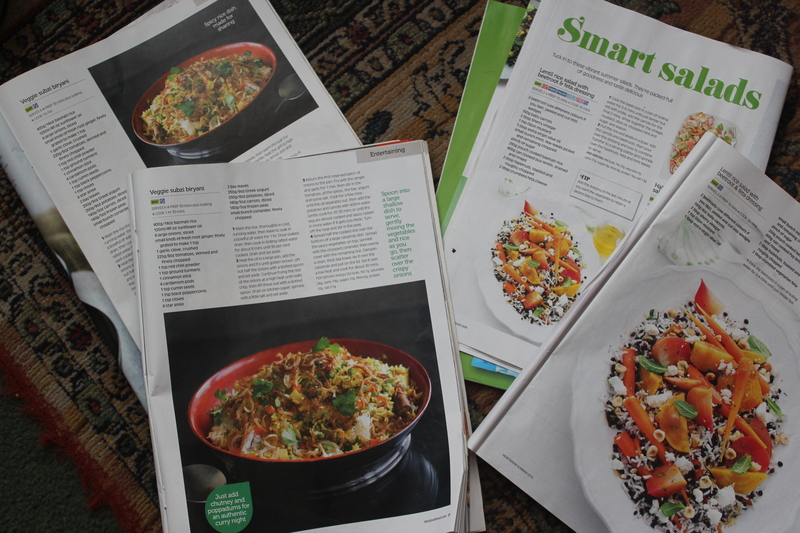 So I pulled a couple of other BBC magazines from the shelves and, hey presto, Summer 2015 and Christmas 2015 were both ideal times to have a Veggie Subzi Biryani. Now, I’m all for recycling, but I’m bloody pissed off at this – if I want to read the same recipes again and again (not even new photos) then I’ll save my money in future and just reread the magazines I’ve got. I feel that they’re taking money under false pretenses. Life, the Universe and would you pass the custard creams?